Nestling on the Estérel coast, opposite the island of Sainte Marguerite, lies one of the best-kept secrets on the Côte d’Azur: Théoule-sur-Mer. Instantly recognisable from its red, rocky coastline, Théoule is found along the Corniche d’Or, one of the most beautiful roads in France, the D559, which runs from Fréjus up to La Napoule. Particularly when the film festival from neighbouring Cannes is held during May, Théoule is often one of the must-go places to stay and party. In part this is due to the popularity of Pierre Cardin’s Bubble House, which hosts many exclusive events. A futuristic property, built in 1989, and designed by Antti Lovag with a stunning view over the Bay of Cannes, it is now classified as one of France’s historic monuments. Large and luxurious sea view properties are not easy to find in Théoule, as most are not usually on the market for very long, but Home Hunts currently has a magnificent contemporary villa that is offering buyers a rare opportunity to make a very special purchase. 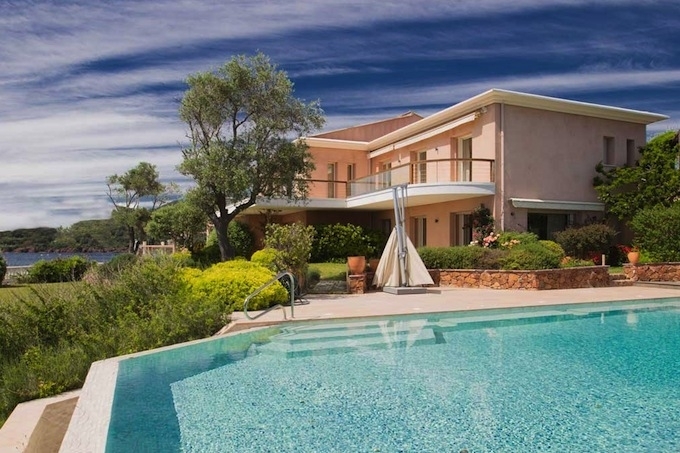 Set on the striking red rocks that breathtakingly characterise Théoule, this six-bedroom, stylish house (ref: HH-5631800 on the Home Hunts website) is set in luscious landscaped grounds of 2,700m2 which provide a perfect contrast to its rocky foundations. Set high above the sea, the large, sparkling swimming pool offers a sensational panorama of the Mediterranean and the many terraces mean that relaxing in the sun and entertaining is possible either poolside or in the gardens. The comfortable, covered veranda that sweeps around the property also provides a spectacular setting for socialising or resting, and this level also offers four further bedrooms (with bath and shower rooms) and a beautiful, roomy kitchen. Up on the entrance level two en-suite bedrooms and a large open living room serve to make the most of the magnificent views. And here there is also a broad, modern balcony that would make the perfect setting for alfresco aperitifs as the sun melts into the sea’s horizon. Residing in this home from home is all about making life as peaceful as possible, and the building boasts many small features that make day-to-day living just that little bit easier. With air conditioning, electric window blinds and shutters, a sprinkler system, security door, electric gate and videophone, the owner of this property will always feel secure, relaxed and in control. The property’s location – near the port and local shops – means that while it offers peaceful and tranquil accommodation away from the bustle of the Riviera, conveniences are just around the corner. Furthermore, flight connections are also not far away as Nice’s international airport is just 40km up the road, and with a train station in Théoule itself, which connects to the TGV in Nice and Cannes, travelling from London or Paris is never anything but quick and convenient. For more information about this property visit the Home Hunts website or contact the France office directly on +33 (0)970 44 66 43.